Myth # 1 – Gangs and gang members have been well defined and documented. According to the Juvenile Offenders and Victims: 2006 National Report on behalf of the Office of Juvenile Justice and Delinquency Prevention (OJJDP), the gang numbers were between 24-30,000 gangs and approximately 760,000 gang members in America (http://ojjdp.ncjrs.gov ). In 2008 The National Gang Center estimated approximately 774,000 gang members and 27,900 gangs to have been active in the United States in 2008. The number of gangs increased by 28 percent, and the number of gang members increased by 6 percent from 2002 to 2008. According to the 2009 National Gang Threat Assessment (NGTA), U.S. Totals: 20,000 gangs = 1 million members. 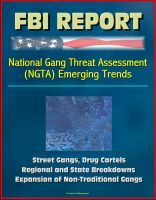 Based on law enforcement responses to the NYGS, it was estimated that in 2010, there were 29,400 gangs and 756,000 gang members throughout 3,500 jurisdictions in the United States. In the 2011 NGTA it was gangs were estimated at 33,000 totaling 1.4 million gang members. There seems to be a lot of discrepancies within these numbers and because there is no accepted written definition of what a gang is the question becomes: How can law enforcement be expected to count gangs and gang members accurately? Recognizing this problem, the National Youth Gang Center, which conducts annual, national surveys for OJJDP, has had to change its definition over the years of which groups law enforcement should count as gangs. Consequently, estimates based on the first definition were inaccurate. For example, one set of data puts the percentage of whites that are gang members at 11%, another at14%, while another puts it at 40%. Which number is correct? According to data from the survey using the second definition above, the number of jurisdictions with gangs was overestimated by 12%, and the number of gangs in those jurisdictions was overestimated by 26% (Klein). Moreover, these and other current definitions used to define gangs continue to make it nearly impossible to get an accurate count of gangs and gang members. “The myth of the growing gang menace has been fueled by sensational media coverage and miss-use of law enforcement gang statistics, which gang experts consider unreliable for the purpose of tracking local crime trends.” (www.justicepolicy.org). Thus, when it comes to the “numbers” law enforcement is doing the best they can with what they have to work with in assessing the national gang issues. However, what it comes down to is each local community will still need to use their own criteria for defining what a gang is, conduct their own assessment of the numbers, and decide where and how to invest their limited resources in prevention and intervention strategies.